Elizabeth Henslowe has written some notes to accompany these recent pictures. Click on a picture for an enlarged version (which will open in a new window). 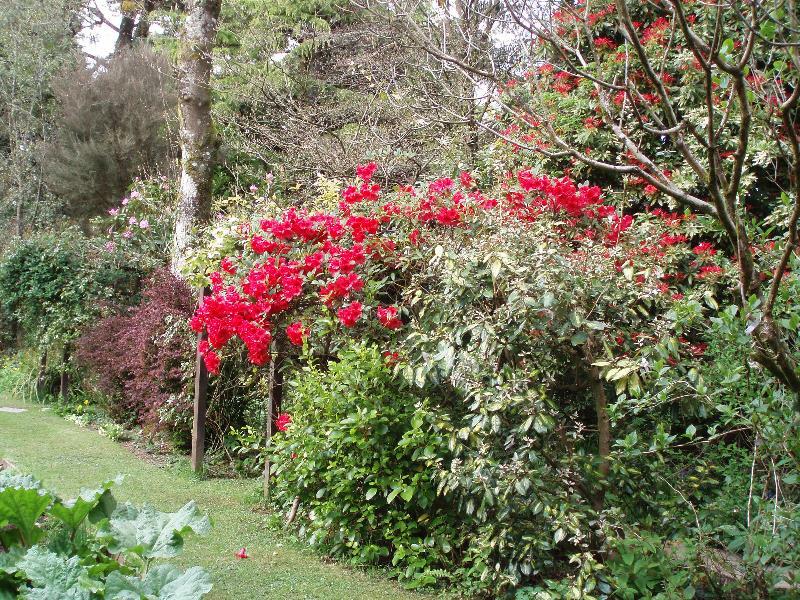 For a great many years this area was shaded all day by the tall bamboos and overgrown with the Rhododendron 'Cornish Red' which had layered itself into a thicket. 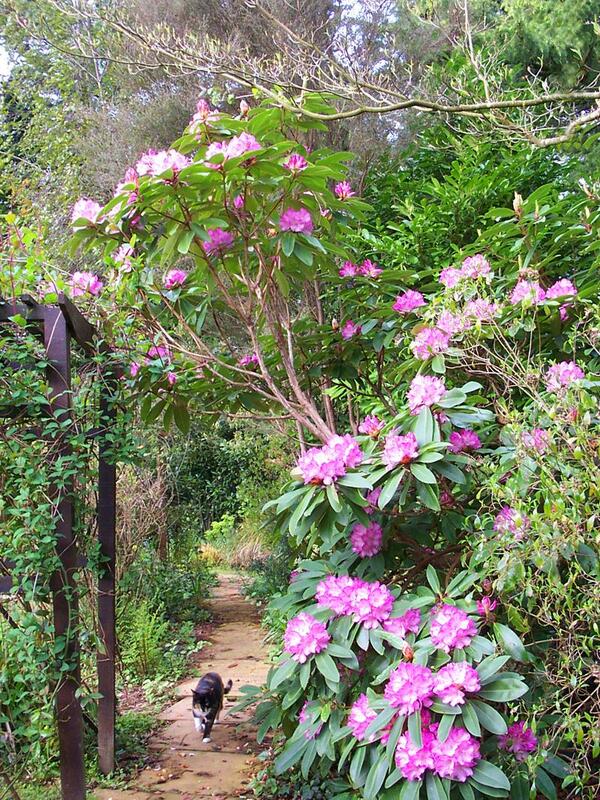 Cutting back the Rhodo. and bamboos has let in a considerable amount of light; enough to create a 'woodland garden'. However, slugs and snails are a big problem here and have to be poisoned. The hedgehogs cannot eat enough to make a difference, and I do not want to poison anything but molluscs. The logs holding the pots of Hostas steady in the wind also hide slug-bait: the hedgehogs cannot reach and hopefully the slug problem is solved. 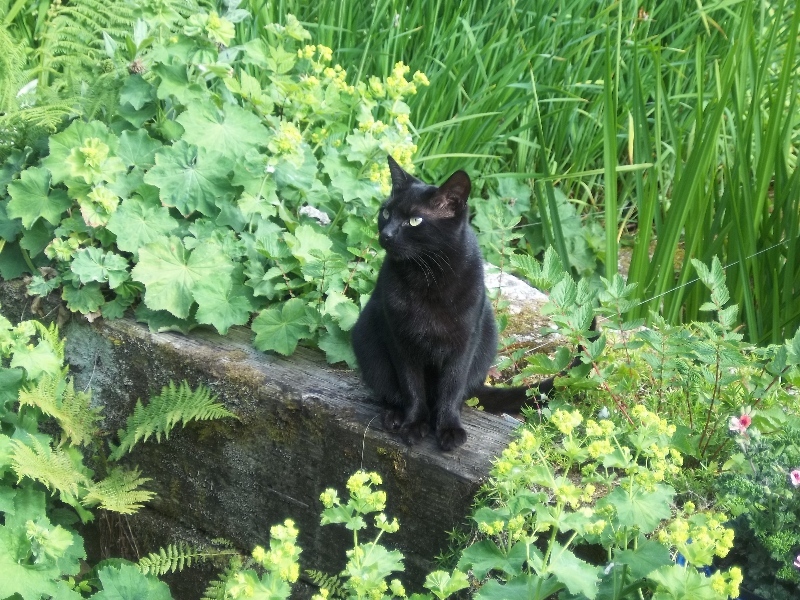 Taking centre stage is our tortoiseshell cat 'Pansy'. To the east side of the vegetable garden is an area we call 'Sweet Chestnut Shade'. The tree Castanea sativa 'Albomarginata' is a rare variegated sweet chestnut with big leaves that shade and drip on and smother everything below. As it is protected by a County Council 'Tree Protection Order' we cannot even prune it without planning permission. It is an example of where NOT to plant a forest tree. 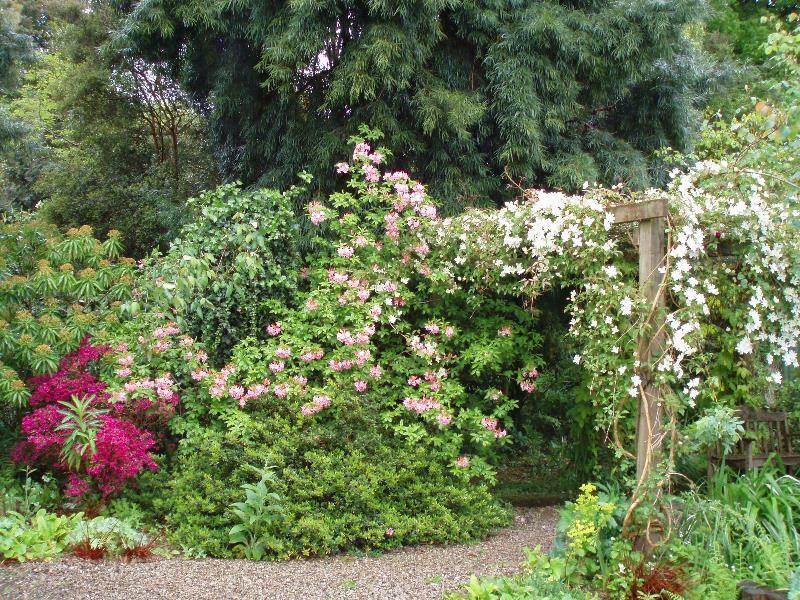 The tallest arch is home to a vigorous climbing china rose, 'Cecile Brunner'. I had flowers from this very plant in my wedding bouquet in 1960: it was more than several years old even then. Another arch supports an Actinidia kolomikta with pink and white painted leaves in early summer. The climbers on the pergola were very badly affected by the cold winters of 2009/10 and 2010/11 and we lost a rose, a wisteria, the hop and a Clematis montana 'Star'. 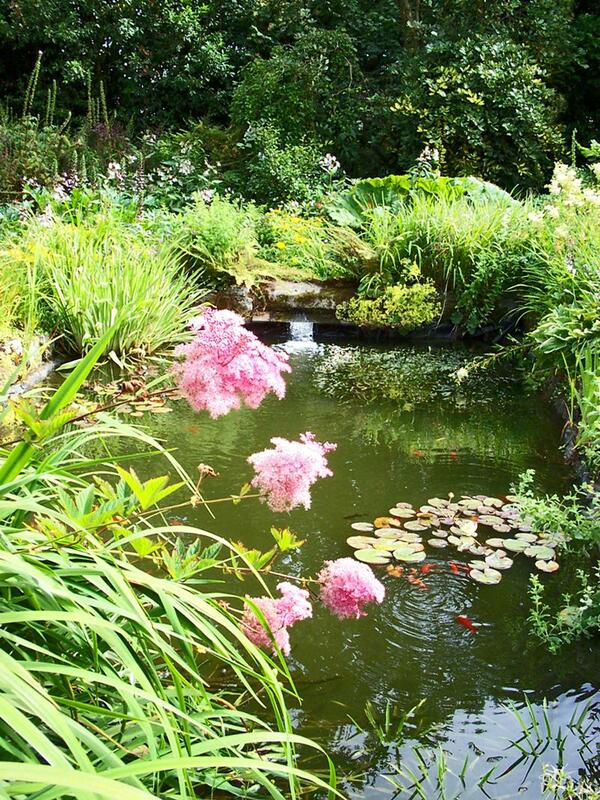 Disasters like this in a garden must only be seen as unexpected opportunities to replant. 'New Dawn' roses and some clematis that are smothering the fig tree are waiting to be moved here, hopefully before we open in 2012. 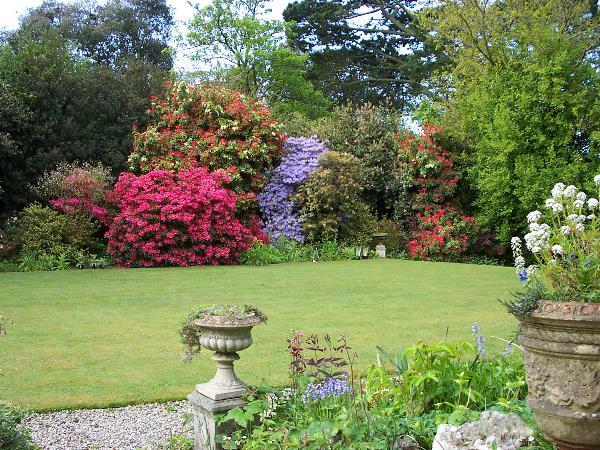 Part of the South Lawn with Rhododendron 'Winsome' on the right and the myrtle at present named 'Amomyrtus apiculata' with heavily scented, cream coloured, double blooms in Spring in the centre of the picture. 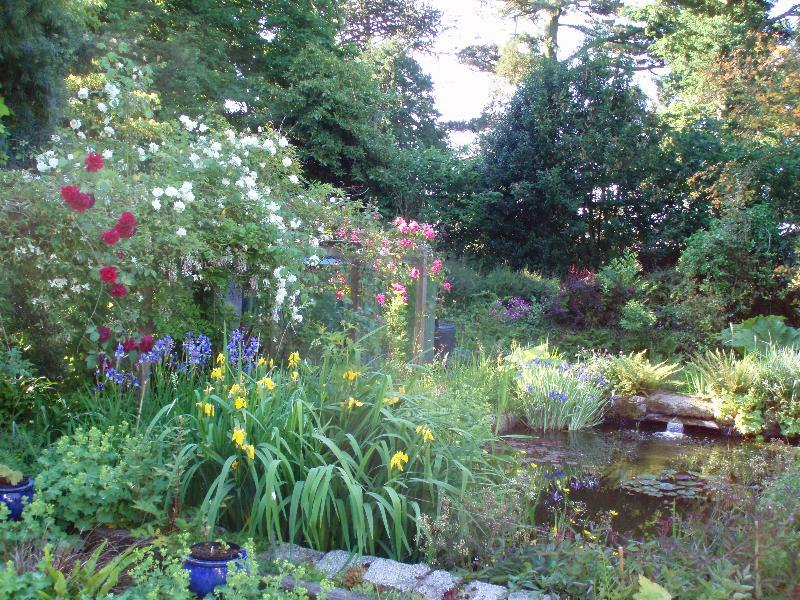 The pond was dug in 1998 on the site of my aunt's dahlia bed. We aren't too keen on massed dahlias and our children's four goldfish needed a kinder home than a water barrel. Despite herons and seagulls, fed naturally on insect pondlife and wholemeal bread, the fish now number over 100. 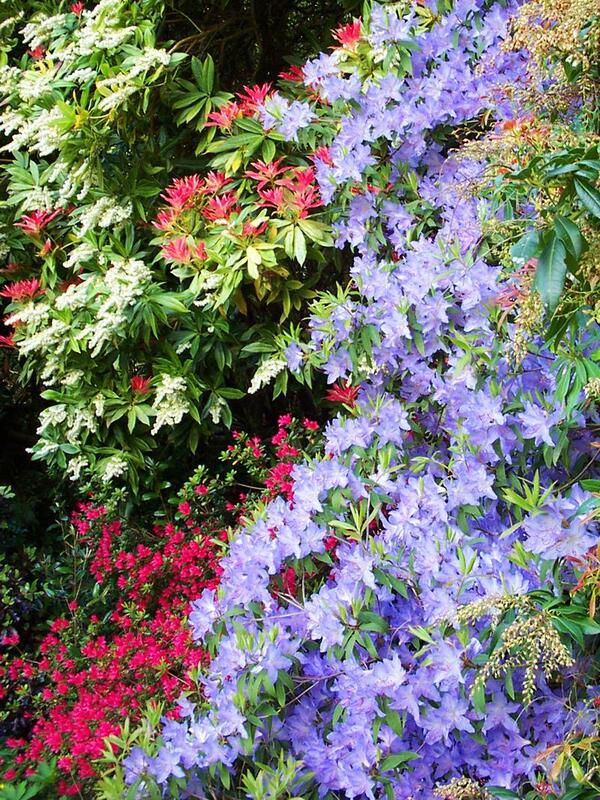 The azalea Rhododendron augustinii forms a blue waterfall between Pieris formosa 'Wakehurst' and the earlier flowering Pieris japonica. 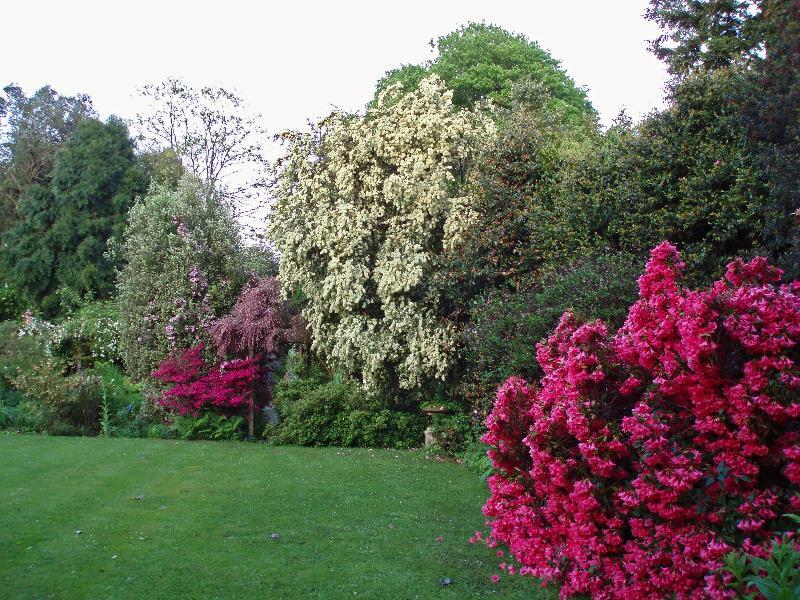 This area was planted in 1953 and is home to a particularly striking lipstick-pink coloured Rhododendron 'Winsome' and many fine camellias such as the rareish white Camellia campsii 'alba' (now propagated by and available from The Duchy of Cornwall Nurseries). 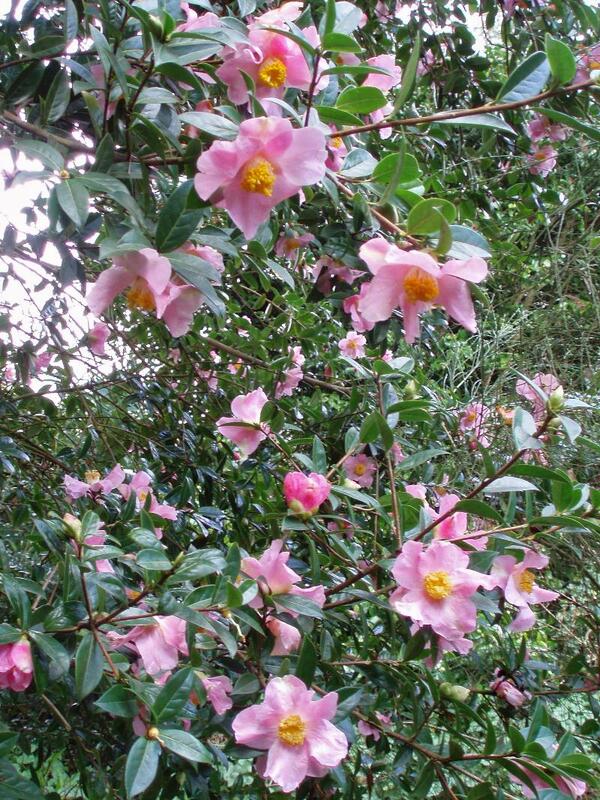 Also of note is the bright pink Camellia saluensis from the Salween River Valley in West Yunnan in China. 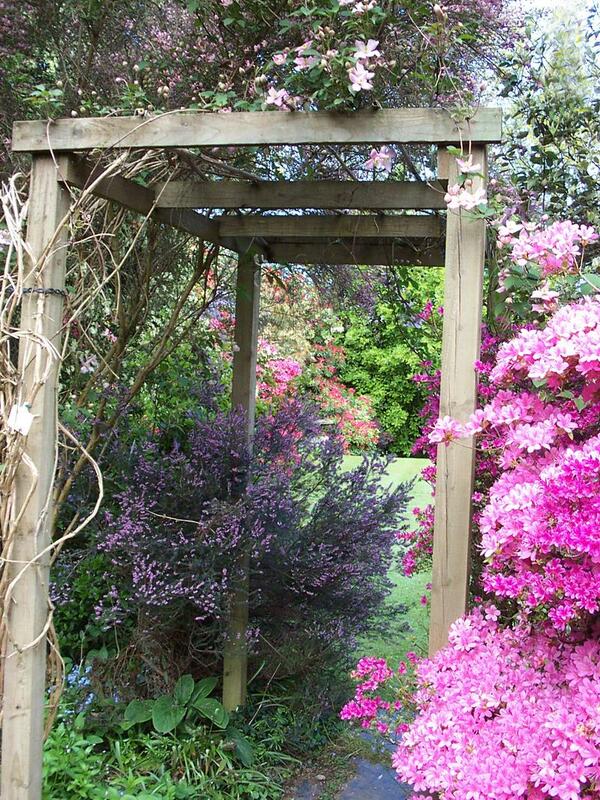 When we began to rejuvenate the garden in earnest in 1998 many of the pathways were overgrown by shrubs so archways were erected to permit access. 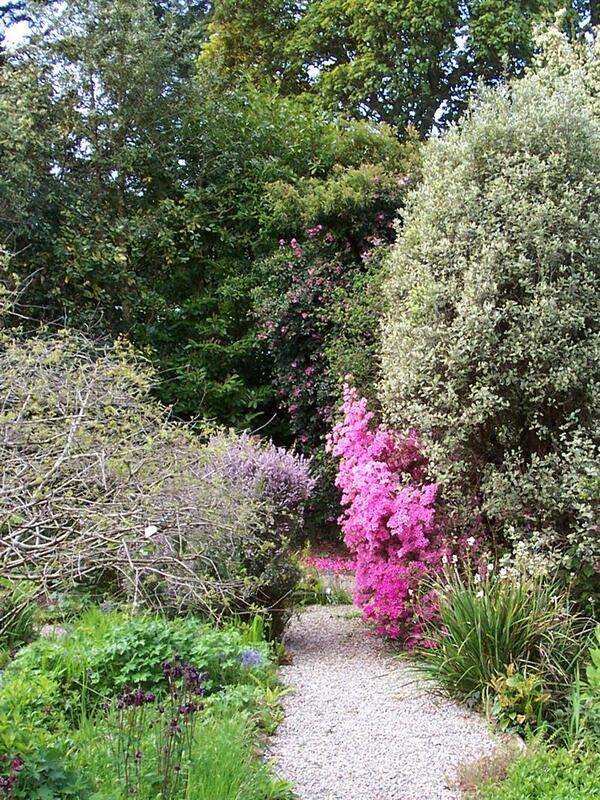 This leads to the South Lawn and supports the dark pink Clematis montana 'Elizabeth'. A tranquil blend of pastels: a grey Pittosporum 'Garnettii' and a pink azalea Rhododendron 'Hinomayo' beside an Erica erigena. Many years ago my aunt was given a handful of camellia seeds by J.C.Williams of Caerhays (the originator of the williamsii camellia strain) He told her to sow them, wait for them to flower and to chose the best to name after herself. She did this and Camellia x williamsii 'Moira Reid' is the result. 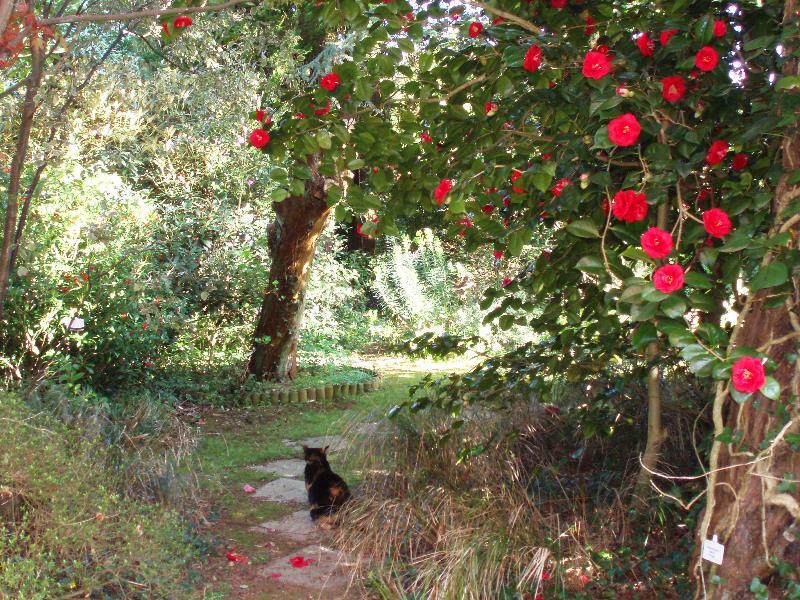 In the fifty or so years since then many other camellia seedlings have been discovered, some have been kept and named after family members or given away to friends to do the same. A very few are for sale. A sport of Marjory Fish's Astrantia major 'Shaggy', Astrantia major 'Moira Reid' was given an Award of Merit on 16th. July 1991 by the Royal Horticultural Society. 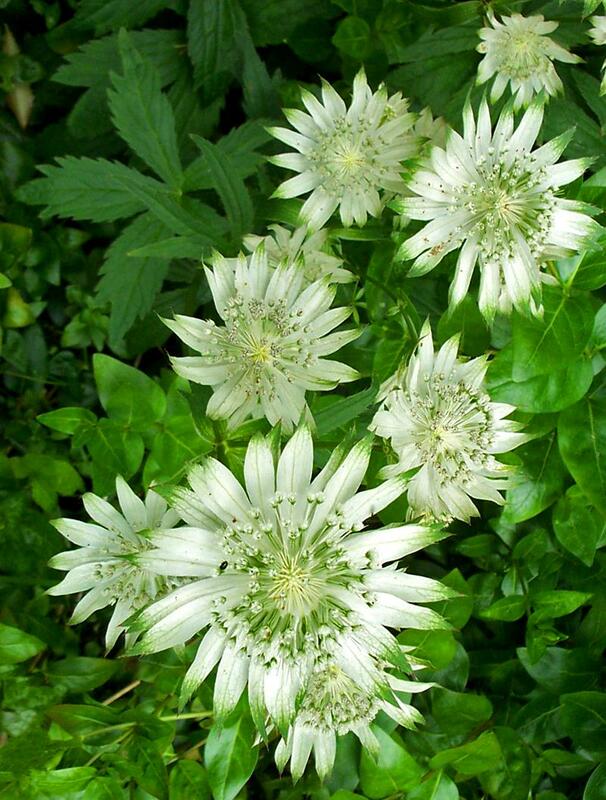 It is totally hardy, spreads politely and most of its seedlings come true to their parent. According to The Plant Finder it is widely available. In full bloom for most of the Summer the grey-green flowers often measure as much as four inches across. 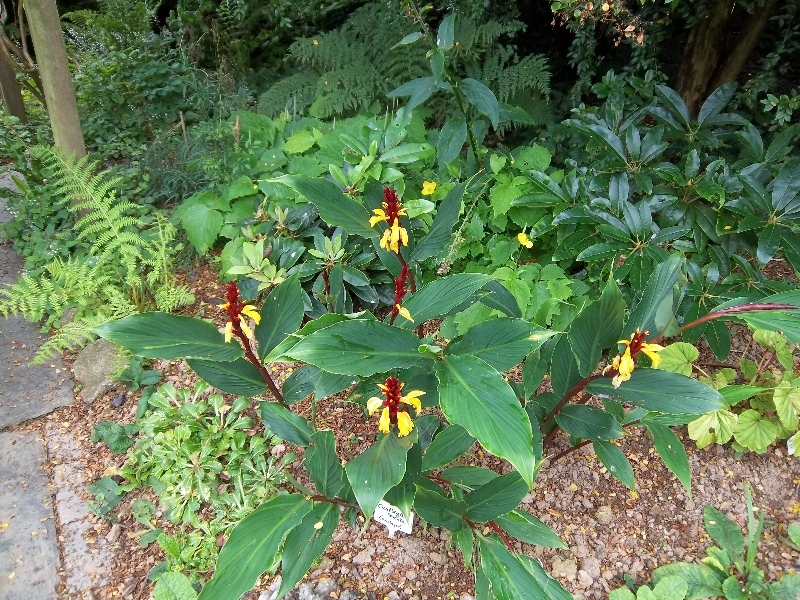 Cautleya spicata which later in the year has yellow leaves and blue-grey seedpods. The yellow poppy-like Stylophorum lasiocarpum grows best in shade and given a mild winter will have flowers for most of the year. 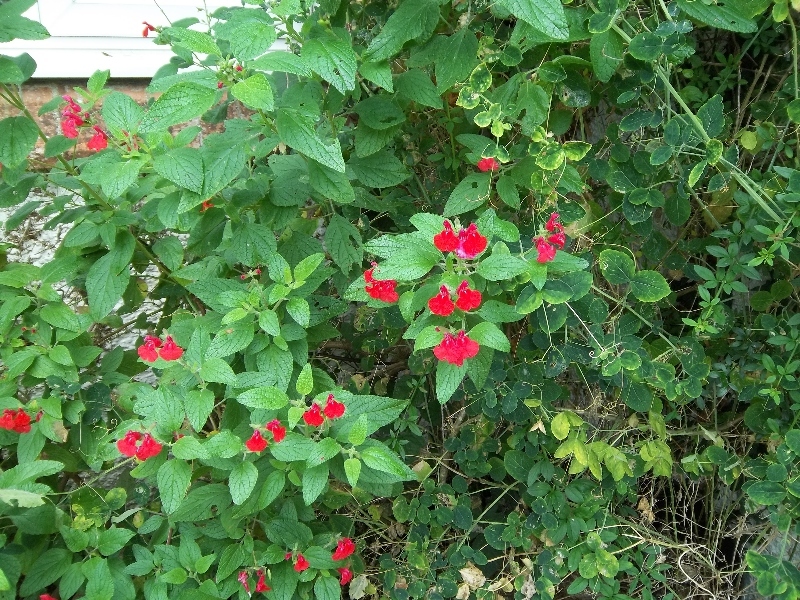 In a south-facing corner near the house this Salvia grahamii (now microphylla) is about 65 years old, one of our oldest plants. 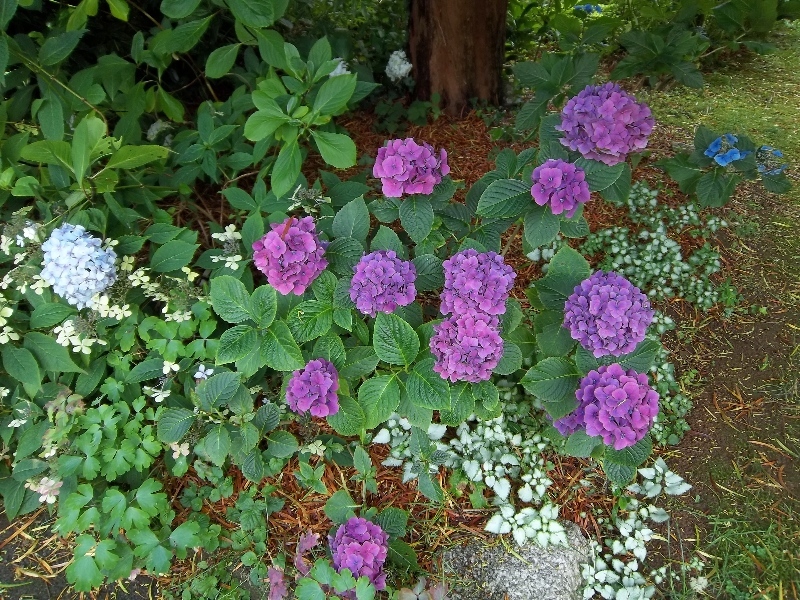 This Hydrangea microphylla 'Pia' was crimson when first planted, the acid soil (5.5-6.5) is the reason it has turned this amazing purple. The tree above is Podacarpus salignus from Chile. It and its partner nearby were cuttings taken by my Aunt from floor-sweepings when tidying up after a Cornwall Society's Show in Truro many years ago. 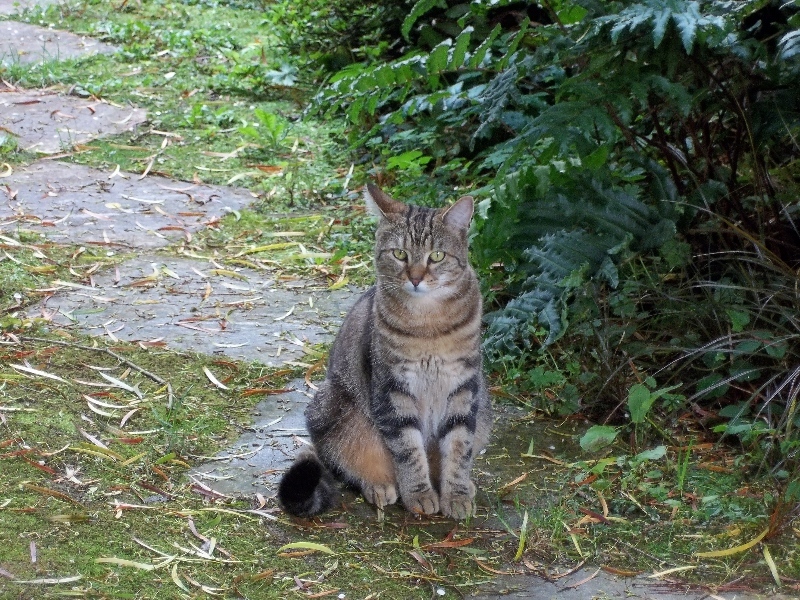 This is Rosie, our tabby cat, she loves to be photographed. Over the years a number of new plants have appeared in the garden. This self-sown broom has enormous flowers and has become very tall. 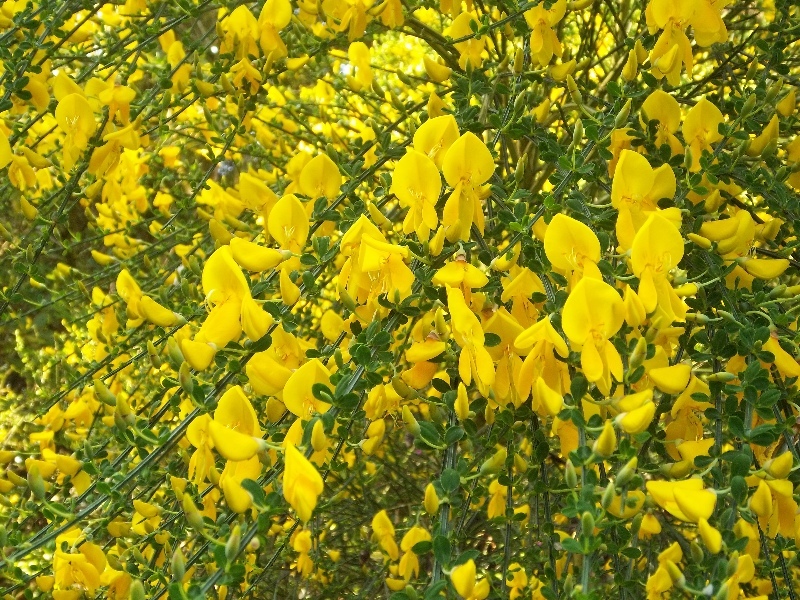 Now propagated by, and on sale at The Duchy of Cornwall Nursery, it is called Cytisus 'Philip Henslowe'. 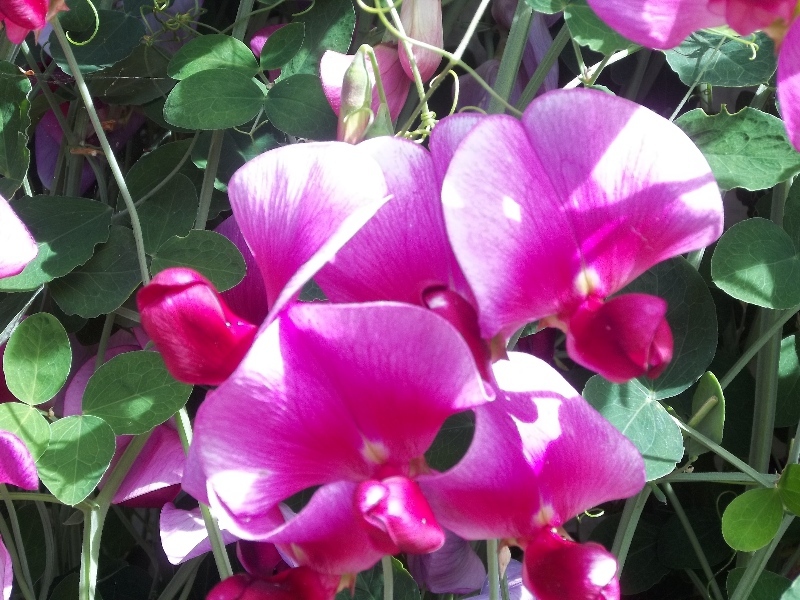 In bloom for a long time every summer this everlasting pea, Lathyrus grandiflorus is a parent of modern sweet peas. Alas only very faint scent and no seeds. Zelah, Rosie's little sister rarely sits still, she has a giant ego and a voice to match. Her tail is kinked like a Siamese cat's. The vet says though from the same litter they may have had different fathers. 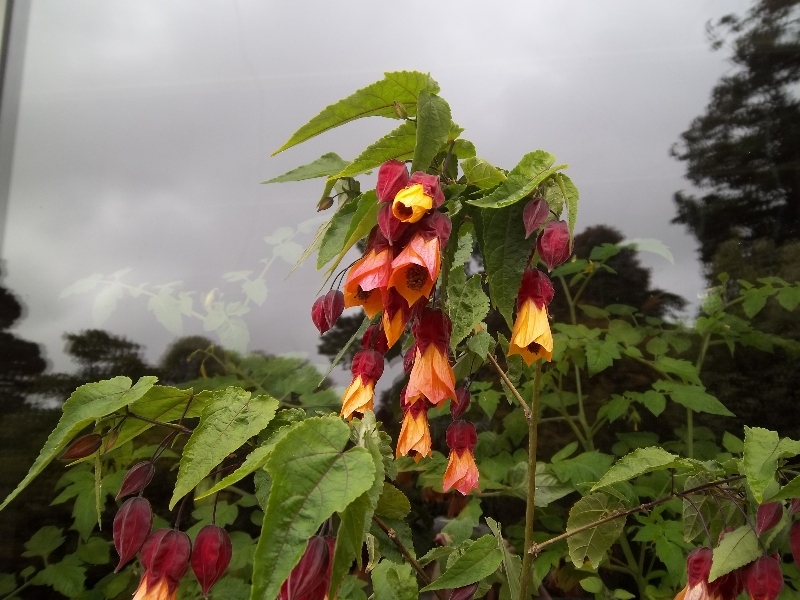 Recently named Anyon Henslowe, this new tall Abutilon is either a sport or a seedling from the Abutilon megapotamicum beside it. Nearby, is a 60 year old dwarf lemon, Citrus limon 'Meyer'. We nearly lost it during the 2009/2010 winter when it was in the ground, now planted in a large pot, it can be moved to the greenhouse if we are threatened by really cold weather. 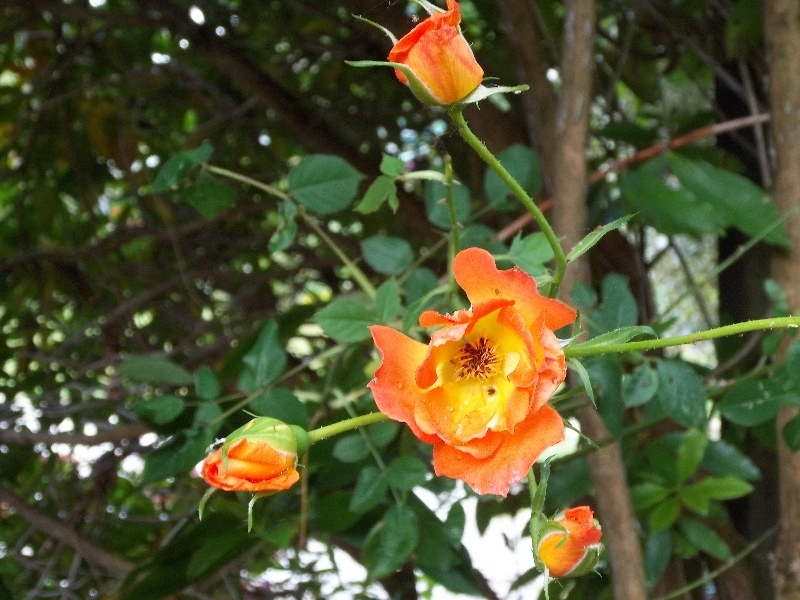 Please tell us if you think you know the name of this single orange rose. It appeared from the root of a now dead rose 'Dance de Feu' in 2011.